(Newser) – It now sounds like Sen. Susan Collins is doing a little more than "leaning against" the GOP's newest ObamaCare repeal effort. "It's very difficult for me to envision a scenario where I would end up voting for this bill," CNN quotes the Maine Republican as saying Sunday on State of the Union. Collins says she's worried about the Graham-Cassidy bill's protections for people with pre-existing conditions and the way it will replace subsidies and Medicaid expansion with block grants. A hundred years from now kids will be saying that they can't believe there was a time when we had to pay for health care. Just like they can't believe there was a time when everyone had a land-line phone or there was a time before the Perpetual War. Drain the swamp of slippery chameleons, like Susan Collins. What is it up there - the water or the weather. 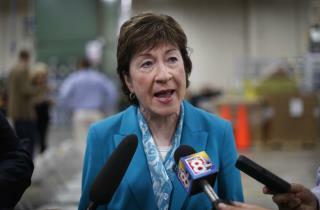 Collins an even bigger camera hog, serious wackadoodle, and flaming Liberal than her infamous predecessor, Olympia Snowe! Why does the Republican Party continue to fund her election/re-election activities when she's even worse than any other RINO out there? Hope the RNC finally cuts off her funding and finds a real Republican to replace her soon!